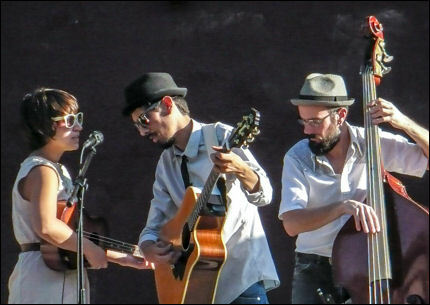 The Haunted Windchimes from Pueblo, Colorado played an excellent set of music at Acacia Park. All the elements came together perfectly for a great, free afternoon of music. 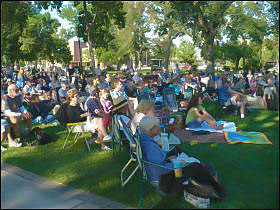 It was a clear and beautiful summer evening in Colorado Springs for The Haunted Windchimes concert on August 4. With temperatures in the 70's, Saturday's cool temperature was a welcome reprieve from the unrelenting heat we had been experiencing all summer. We arrived at the park early and spread out our blanket close to and centered in front of the Bandshell stage. I set up my gear to make a recording (left). After a brief introduction, the band started with "Waitin' For A Train." The sound from the PA system was crisp and clear. I was impressed with the band's vocal harmonies right from the start. Cab Calloway's style of music came to mind during the first few of songs. Desirae Garcia's voice stands out. She has a clear and seductive quality in her singing that is easy on the ears. Her songs "Steal Your Voice" and "Little Box" were highlights in the groups set that clocked in slightly over 2 hours long. I must comment on how quiet and attentive the audience was during this free concert. There were several young people quietly dancing in front of the stage which was very nice to see. The rest of the audience members (below left) were also very quiet and respectful of the music. They listened intently and without much chatter while the band played. This is not something I see very often at free public music events. The band gained momentum throughout the evening. With the exception of necessary tuning up between songs, the pace of the show was quick and deliberate. Inaiah Lugan appeared to be the leader, calling out the next song to be played to the band members between songs. Everyone but bass player Sean Fanning sang lead. Brother and sister Inaiah and Chela Lujan along with Desirae Garcia sang lead and harmony parts on most of the songs. Inaiah Lugan pointed out that all of the band members are songwriters. So, not surprisingly most of the songs the band played were originals, and all of the compositions were very good. Among the other standout songs were Mike Clark's intense "Bound To Break" and the haunting and timely "Make It Rain". The band seemed to be having a great time on stage. I could see that energy being absorbed and reciprocated by the audience. Chela Lugan provided some light comedy moments bantering back and forth with her band mates about her song writing between songs. The Haunted Windchimes have a unique and refreshing sound and style. A mixture of traditional folk, blues, bluegrass and ragtime. The vocal harmonies are excellent. The band's music is vibrant and infectious and never strays far from it's authentic American roots. 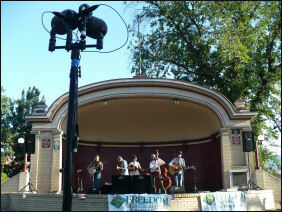 The group's free concert in Acacia Park was very enjoyable. If you have not seen them yet, do yourself a favor and go see them perform. You can hear what the band sounds like by following the link below. There, you can stream songs, download MP3's and download the complete recording of the show via BitTorrent.